Ryan Holmgren of the Casper (Wyo.) Star-Tribune and the team of Kalle Oakes, Justin Pelletier, Fred Gage, Lauren Schneiderman, Carl Natale, Russ Dillingham and C. Ernie Anderson of the Sun Journal (Lewiston, Maine) tied for first place in the Associated Press Sports Editors 2015 contest in the projects category in the Under-30,000 circulation category. The Sun Journal’s project looked back at the controversial 1965 heavyweight championship fight between Muhammad Ali and Sonny Liston in Lewiston. Holmgren’s project examined the challenges of the University of Wyoming and other schools in the Mountain West. The winners will be presented a first-place plaque at the 2016 APSE banquet. The banquet and awards dinner concludes the APSE Conference June 22-25 at the Omni-Charlotte in Charlotte, N.C. Balloting by six APSE judges ranked two entries in a tie for first place. Third place went to Scott Parks, Adam Boedeker, Steve Gamel, Patrick Hayslip and Brett Vito of the Denton (Texas) Record-Chronicle. The contest is open to APSE members. Click here to join. 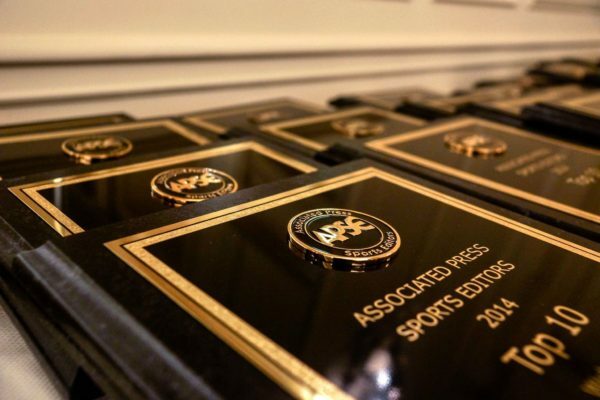 Sports editors in the Under 30,000 circulation category submitted a total of 19 project entries written or directed by APSE member sports departments in 2015. Contest chair and APSE first vice president Tommy Deas numbered each entry, assuring they had been stripped of headlines, graphics, bylines and any other element that would identify the writer or news organization. In late February-early March at Poynter Institute in St. Petersburg, Fla., preliminary judges selected a top 10 ranked, with each judge listing the stories in order from 1 to 10 separately on a secret ballot. The final 10 were given to a second judging group, which also ranked the entries 1-10 in the same fashion. The winner and final rankings are determined by tallying the ballots, giving a team 10 points for a first-place vote, nine points for second and so on down to 1 point for a 10th-place vote. Winning on both courts: Is there a correlation between success in volleyball and basketball? The Long Ball: Is soccer bad in West Texas?